1. The color palette for the room is full of warm tones like sunny orange and yellow along with some rich dark wood tones, some basic neutrals like mocha and tan, and glossy white trim. As for the exact wall color, since I cobbled this board together with the intention that these items would seamlessly slip into an already neutral room, I added that strip of warm cream paint along the top of the board to represent the wall color (like Water Chestnut by Glidden), but really any warm-ish neutral on the wall should work. 2. I actually thought a bunch of these fun plates with a pop of citrus-y orange from Crate & Barrel could look awesome hanging on the wall in a little cluster above a mantel or over the sofa to add interest and dimension. They’re only $3.95 a pop (on clearance) so you could grab ten of them for around $30 and just mount them on the wall in a big cloud-like cluster using plate hangers from the craft store. 3. This is the pillow that started it all. I love it so much, and thought it would be fun to build an imaginary room around it. So it got dragged into my little photoshop doc first (yup, I use photoshop to make these, but I’ve heard great things about mydeco.com and polyvore.com – which are both free). Anyway, ain’t she a beaut? Two of these on the mocha sofa along with one solid pillow in one of the colors of the patterned pillow (like orange or yellow or even pink) should do the trick. 4. Since I was making this imaginary board for someone with creamy neutral walls and a tan/mocha sofa, I figured they’d already have some standard wood end tables. So instead of a matchy-matchy wood coffee table I thought it might refresh the room if they switched out the coffee table for these nested little texture-filled woven tables. They could be casually placed in front of the sofa and work along with the basic wood end tables they already own. Just to bring in another tone/texture/finish instead of more wood. Oh and I bet they’re DIYable for anyone with the patience to make them out of hardware store wood and wrap them with rope for the same effect. 5. These Ikea curtains are elegant yet playful – kind of like fancy little coffee bean sketches dancing up the wall. The cool thing about them is that they’re super neutral so they’ll layer into the room so easily (while adding a bit more texture thanks to the geometric detail). And they’re just $15 a panel even though they’re extra long. Ikea for the win. 6. These great sculptural lamps will add even more interest to the room while allowing the pillows, wall plates, and rug to be the happy little punches of color among other classic and neutral touches. Oh yeah and they’re just $49 each (down from $100 a pop!). 7. This handmade Thom Filicia rug from Overstock.com had me at hello. First of all, it’s really well priced (just $143 for a 5 x 8). And second of all, while some folks would be scared to bring in color with a rug, sometimes it’s just what a room with neutral walls and a neutral sofa needs! 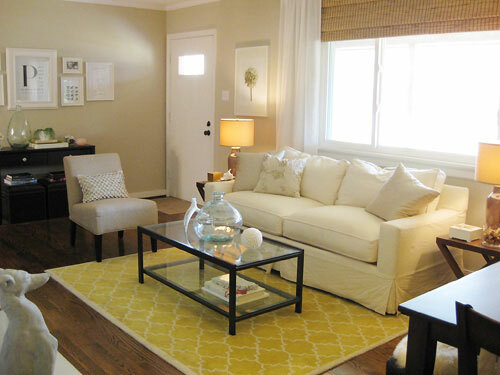 Take our old living room which sported a cheerful yellow rug with a cream sofa and tan walls for example. 8. This is just a mocha sofa that I threw in to “complete” the picture (even though I was assuming that folks might already have one). If you don’t have a sofa this color (say it’s cream or soft sage or white or something else) just bring in the accessories that you like and see how it goes. It could totally work. You can always go for a slipcover if you think the sofa color is the only thing throwing the room off (they sell them pretty affordably at places like Bed Bath & Beyond and Target- although I’m not sure how well they’ll fit your individual sofa, but you can always try them and return them if it doesn’t look right). And if slipcovers don’t do it for you (or your current sofa is shot), this guy is only $699 thanks to a big JC Penney sale (he was originally $1200!). So there you have it. My little imaginary neutral room mood board. If you end up getting some of the items and pulling them into your house I’d love to see pics over on our Facebook page! Do you have any favorite things? I’m kind of in love with the rug and of course that pillow had me at hello. Ah pillows, you make me happy. Have you guys been making any mood boards these days? Do tell. now i reeeeeeally love you guys! I’ve been trying to come up with a plan for our family room using these colors for awhile now and you just did it for me. So glad to see another one of your mood boards! I love the bright colors – especially that pillow! Those pillows ARE room inspiring! Looks great! And I love those curtains! You should definitely do more mood boards. It takes skillz to pull a good look together and you’re fab at it! Yay ! Love the return of the mood board- even just for fun. Thanks, Sherry ! This is a great color palette to brighten up a neutral room. Well done! I am an area rug fanatic, however our house has wall to wall carpet. I was wondering how you feel about using area rugs in rooms that are already carpeted? Is it too much of a good thing? I’m all about it! Layer away! We’ve seen it done so awesomely and it can really define a seating area. It helps if the rug isn’t super high pile though- just so you don’t trip on it. Those plates will be MINE! I LOVE your mood boards!!!! Can’t tell you how many times I’ve had the urge to redecorate a room after looking at the mood board page here! Countless! Even just-for-fun, non-commissioned mood boards make me soooooo happy! I love that you made this mood board taking into consideration what a lot of people are likely to have already (like the cream walls and mocha sofa). I have neither, (I’m kind of into gray, gray and gray…and white) but I love the revamp-whatcha-got mentality! Soooo, if you’re ever in the mood to make an imaginary mood board using, uh, gray, gray and gray with a “what the ‘h’ was I thinking when i bought a sage green sofa”, I’ll be patiently waiting, haha! Haha, well I did make a board for our living room a while back with soft gray walls and a dark gray sectional! You can find it by clicking the link to our mood board gallery in the first sentence of this post! Cute!! That pillow IS super fabulous. You know you’re doing things right when Centsationalgirl using you as a reference for perfectly styled bookcases! No way! Amazing. Off to check it out! Hooray! Oh, how I’ve missed your mood boards! I heart that rug. Fun! Have you created mood boards for any of the rooms in your house? We made a just-for-starters board for our living room and bedroom a while back. You can find them by clicking the link to our mood board gallery in the first sentence of this post! Warning: nothing about this fantasy board is low-budget-friendly! YAY!!! So glad to see a mood board again!!! They are always so inspiring!!! This one is truly outstanding….looooooove those C&B plates! Two thumbs up for mood boards. They’re one of my favorite things about YHL. Keep up the amazing inspiration!! Sorry Bob. I’m not a math girl. Just grab eight. Or seven. Odd numbers can be more fun anyway! Ha! Now that was pretty funny, Tia! I like it! Sherry, a question about moodboards! (Or maybe a few questions, sigh) Do you have to manually chop off the background of some of these images (or all) in Photoshop or is there something snazzy that helps you do it or do the images come with a clear background or maybe there’s another option I haven’t yet thought of??? Also… Do your mood boards (which I gladly admit I bet I’ve seen each one!!!) start with one inspiration piece, as this one did with the pillow? I’m trying to convince my husband of some decor ideas I’ve got floating around my head and I think a killer mood board would tip the odds in my favor. All of the ones that I’ve tried look disjointed and random, but maybe that’s just because I’m so critical of them and if someone else made the same thing I would be in love. Again, le sigh. Love the site, as always. Any help is appreciated! Yup, in photoshop I select the background with the line tool and delete it or erase it. As for making a mood board, I usually start with something that inspires me (whether it’s a colorful pillow or a cool glass table or a sofa someone already has) and then I just build off of that. Have you tried polyvore.com and mydeco.com? We’ve heard their boards are the best! Fun! What a serene space you have planned! Love the plates! A friend told me to always buy in odd numbers this way when one breaks, you have an even set! THANK YOU! THANK YOU! THANK YOU! THANK YOU! THANK YOU! THANK YOU! THANK YOU! THANK YOU! THANK YOU! THANK YOU! THANK YOU! I have missed the mood boards SOOOOOOOO much!! You just made my day. My weekend. My week. My month!!! I’m so thrilled you did this mood board because we’re doing our family room in orange & brown and I’m always looking for inspiration for that color scheme. I am lining my dresser drawers with fabric similar to what you did with Clara’s (but with paper). Did you get your Mod Podge at Michael’s or Home Depot? Can it be used with fabric or just paper? I got it at Michael’s. I think it’s only meant for paper but I’m not sure. Maybe go to Michael’s and look for any sort of fabric starch or fabric glue and just use four small dots to hold down the corners? Those lamps are the bomb dot com. Understated but totally interesting. Aw that’s sweet! And kind of surreal. And yes, we use photoshop for all of our boards. Hope it helps! I always say that bringing home a ton of pillows to see what looks best is a fun idea (just return what you don’t like and use the ones that work as a springboard for art and accessories). Good luck! just an FYI for anyone interested in that rug – we have it, and it is super cute, but I can’t imagine using it in a living room (or over carpet). It says indoor/outdoor, but it’s made from plastic and it definitely shows. probably not very safe if you have rugrats running around. it would be great in a sunroom or another covered outdoor/indoor space. Thanks so much for the inside scoop Anu! Just using it as a starting point for a wool or cotton rug with a similar look hopefully can work! I remember you making a few moodboards for readers….but I never saw the “after” pics of their rooms. Did I miss them, or did they not follow thru with the plans? Anyone who sent after pics got a post devoted to the makeover and we linked to that post in the original mood board post (we probably got about 20 rooms back as updates). So if you see a little update at the bottom of the mood board click that to see the room transformation! I love this mood board! These colors are so great together. I love the neutrals! Ooh, beautiful! 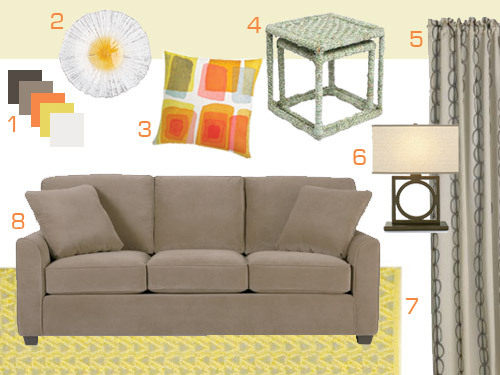 I’ve been eyeing neutral sofas lately since it’s easier to play with different colors. My current sofa is an eggplant color and my friends call it the “Barney” couch! Wowza it’s a tropical oasis out there…and sadly I get looks about how pale my legs are because my face is tan. Darn you florida sun! oops, wrong post! that’s what I get for multi-tasking. Haha- no worries. I knew what you meant. Thank You! My pinterest is full of colors to o with a brown couch. I love this combination. Oh yeah I love that project! So much fun! Although now that we have our patterned curtains up I’m happy to let those be the star and let the chairs stay basic brown. You inspired me to take a break from work, check out mydeco.com, and throw together a quick moodeboard for my office in the house I’m about to move in to. Now I can’t wait! And I also discovered the run I’v ebeen oogling at CB2 is now on sale >50% off! Oh man it sounds awesome and I’d love to see it. It told me I’m denied though. Haha. Rejected. Oops I forgot it was set to private – just made it public, so it should be visible now! Oh my gosh it’s gorgeous!!!! Love it. I really miss the mood boards. That was my favorite part of your blog, and I didn’t get the same inspiration when you stopped making them. Agreed. Counldn’t have said it better. That’s so hard! I love taking photos of the exterior and even trying to draw out an aerial layout and then just sketching to see what planting beds you want where, etc. BHG.com also has free downloadable garden plans for all sorts of yard sizes and shapes! Great board!!! Apparently I am the only one who started singing “oooooooweeeeee, what’s up with that? What’s up with that?” from SNL after reading your second sentence….guess I’m the crazy one in the bunch. ; ) Love you guys! (And I mean that in a “I love to read your blog and glean from your ideas” kinda way, not in a “I love you guys, can you hear me breathing on the other side of the phone” kinda way.) Just thought I’d clarify. Haha- we sing that a lot around here too. Complete with dancing around (running man, the charleston, etc). As for the breathing on the other side of the phone joke. High-larious. You got audible laughter and everything. I can’t find the post, but I am pretty sure the curtains you were lusting over are on the markdowns list. I thought I would give you the heads up! Thanks so much for the tip! Off to check it out!